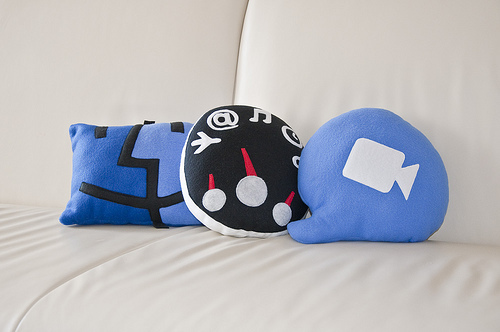 It’s been a long time since I’ve had a prize giveaway, so I’ve teamed up with Roberto Hoyos to bring you the Throwboy icon pillow giveaway! For those of you who don’t know Mr. Hoyos, he’s the Chief Nerd and Founder of Throwboy—an online company that sells OS X icon, chat, and web-inspired pillows. 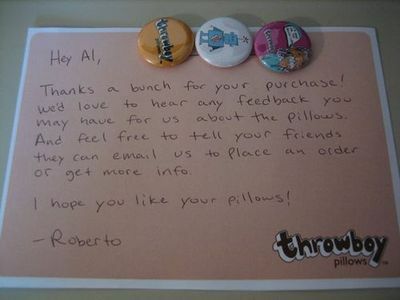 Obviously I wouldn’t be The Closet Entrepreneur if I didn’t ping Roberto for entrepreneurial advice, so below you’ll find some startup tips from the Throwboy founder himself—as well as all the details on how you can get a free Throwboy pillow for yourself! Q: What’s the most unexpected thing you’ve encountered while starting Throwboy? Roberto: I was a little surprised at how long it took to get a website up and running, a lot of beta testing goes into making something that works. I’m really used to just banging things out quickly and the site wasn’t really something that came together as fast as I had hoped. It’s good to be detailed, but don’t let your project take forever or people may lose interest, or someone could steal your idea while you’re obsessing over perfection. Q: How did you bootstrap your startup? Roberto: My bootstrapping technique was to give up sleep. Why not, right? It’s so overrated. Honestly, if you’re going to build something from an idea to a business, you’re going to have to sacrifice something. The way Throwboy really got rolling was when I quit trying to do things the professional or sane way (i.e., getting a loan, hiring workers, getting a factory to sew) and just did everything myself—sewing, cutting, pattern making, shipping, customer service, you name it. The point is if you want to start something, just do it. Whether you start your company with $100 or $100,000, money shouldn’t be a factor on whether or not you make things happen. And if you still need money, you could always play credit card roulette and get yourself into a heap of debt! It’s definitely a motivator to be successful. Q: What’s your advice for entrepreneurs wanting to sell things online? Roberto: If you’re looking to start selling products online, I highly recommend using PayPal’s shopping cart. It’s simple to implement and it’s trusted. Also, your buyers don’t need a PayPal account to use it, and it handles currency conversion and sales tax. Really think about the user’s buying experience and what’s going to make sense to the average buyer? Don’t try to reinvent the wheel when creating your buy page/shopping cart. These things are standardized for a reason. Use that to your advantage and use services like PayPal to get you off the ground with a comprehensive shopping cart and checkout experience. Sure, PayPal isn’t the most professional looking thing in the world but people trust it and know it. It should be so damn easy that grandma can figure it out. For example, check out Woot.com and Amazon.com—each has a great buying experience. Q: What has been the most important startup lesson you’ve learned so far? Roberto: I’ve learned to get things in writing! Even if it’s your best friend, you need to get things in writing. If you’re honest and upfront with the people you choose to work with, they’re not going to take it personally. You shouldn’t worry that they will because it comes down to the bottom line. If the terms of your working relationship are not properly laid down when the money starts flowing in, then you’re going to wish you took the time to get everything in writing. You’ll hear this a lot, and that’s because it’s truly important. I also learned that having a niche audience is very powerful. Throwboy has a very targeted product but that’s the beauty of it; we’re able to focus on a specific group (in our case, geeks like us) and give them what they want. It’s also very important to communicate with your audience to make sure you’re doing it right; after all, this is a business and (cliche alert) the customer is always right. Alright readers, I hope you take Roberto’s advice to heart! Now it’s time to get in line for the giveaway! The process is simple—to be entered in the random drawing for a Throwboy OS X Icon pillow of your choice, simply leave a comment! …and I’ll enter your name twice! Also, be sure to leave your Twitter handle in your comment so I know who you are! The deadline for this giveaway is Friday, March 6th at Midnight (Pacific Time Zone), and the winner will be announced on Sunday, March 8th. Happy commenting and good luck! nice article, tomas, very helpful insights. Tomas, great interview. I love the part of “Just do it yourself” instead of the “sane” answer. I hope these all take off well! Oh my goodness. If I won these, I would totally buy a couch just for them. Great article from a truly great guy. Follow him on twitter at @throwboy for an interesting and fun feed. And that is definitely going to be re-tweeted by me, @TheSniperMonkey. Awseome interview! I was excited to read and find out how Throwboy got started… and I think it’s great that Throwboy isn’t some kind of big corporate company! I wonder what pillow the winner will choose??? And of course, I tweeted this! WooHoo! I already own two Throwboy pillows, lets hope this gets me a third! 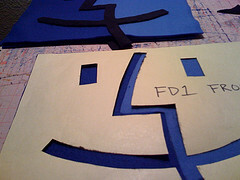 I just ordered a Finder Throwboy. I can’t wait to get it! 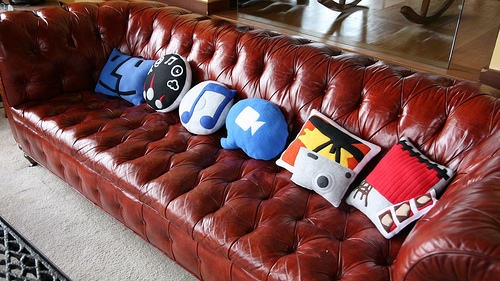 Awesome pillows! I’ve wanted one since the moment I saw them featured on iJustine’s Valentines video. (I’d really love to have a pink one… without the strange heart eyes. haha.) So cute!! I’d love to win one of these to give my girlfriend as a present – she would love it. These things are awesome! I’ve always wanted to get one, but never got around to it. Let me guess, despite my seductive wily ways, my multiple personas are ineligible to vie for multiple entries? Cause I’ve got a few I can bring to the table. the only thing I want to know is why I never heard about these before! Great interview (and marketing strategy btw)! All great information, customer satisfaction, making the web work for you, keeping things simple yet great. I love how he sticks to what he’s good at and doesn’t start going all over the map with his product line, very smart. I’m with Byron on this one, why didn’t I know about this company before!? I do like the fact that he mentions to just get something out there… because somebody will take the idea and/or lose interest completely… even you will! “Just do it” should be everybody’s motto. It’s the only real way to think about things… just frickin do it! Bootstrapping is the only way to fly these days with the lack of seed funding and angels running around willing to drop money on the latest .com or twitter app. Although I’d avoid loading up your credit cards, but you have to do what you have to do. I do like the usability factor he threw in there…. Ecommerce normally gets VERY ugly very quickly and with him looking at the user experience saved him a lot of hassle throughout the development phase and later on with abandoned carts. Also I think Paypal is a great start for small biz, as is now Google Checkout. Also I’d want to mention sites like Shopify.com and Goodbarry.com for small biz with limited resources who want to sell things. This is a awezum post. Thumbs up for Throwboy and the pillows!!! Throwboys are springy: omnitensional integrity. Thank you all for leaving such great and insightful comments, and I’m glad you enjoyed Roberto’s startup advice! Stay tuned and keep those fingers crossed! The grand winner is Chuck Reynolds! Congratulations Chuck, I’ll be sending you an email shortly! Hey right on… thanks Tomas for the nice interview and posting of it, and thanks to Throwboy Pillows for the advice and the prize.